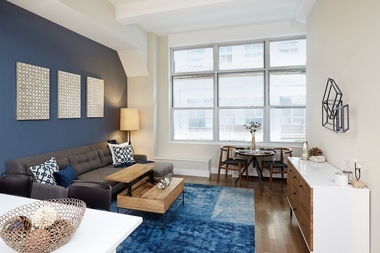 An alcove studio model home at Sienna 37 – a new industrial-to-residential conversion at 321 West 37th St. Prices for for these units start at $2,900 per month, according to Citi Habitats. The firm found that studios in Manhattan saw the biggest price increase in May. Average rents for studios rose 5 percent to $2,228 a month. MANHATTAN — Average rents in Manhattan hit $3,475 a month in May, setting a new record, according to a Citi Habitats report released Thursday. It eclipsed the previous high of $3,470 a month, set in June 2014, according to the firm that has been tracking monthly rents since 2002. "Just when you think they have reached the ceiling, rents continue to climb," Gary Malin, president of Citi Habitats, said. As prices rise, renters are getting less space for their money — and often struggle to squeeze their furniture into these tiny areas. Renters in New York City pay an average of $2,250 for 500 square feet, according to Zillow, making it the most expensive rental market in the nation based on square footage. In San Francisco, which is the second most expensive city for renters, you'll pay $1,640 a month for 500 square feet. At the other end of the spectrum, in Dallas, you'll pay $480 a month for 500 square feet. Despite Manhattan's high prices, renters don't seem to be fleeing. The borough's vacancy rate in the last month fell to 1.07 percent, the lowest in three years, Citi Habitats found. Murray Hill, an area popular with recent grads, had the lowest vacancy at 0.67 percent, followed by the Upper East Side at 0.77 percent. The highest vacancy rate was on the Upper West Side (1.49 percent), followed by the West Village (1.34 percent). On the brighter side, landlords were giving more concessions this May compared to last year. Some 12 percent of the transactions brokered by Citi Habitats offered a free month’s rent and/or payment of the broker fee to entice new tenants. That was up from 7 percent last May. "Typically by this time of year, most landlord incentives would be off the field," Malin noted. "But the silver lining to the high rental pricing is that they are still in play in some buildings." Giving concessions, like a free month, allows landlords to give their tenants a "deal" without having to lower their "face" rent. In the trendy parts of Brownstone and north Brooklyn, average rents were $3,252 a month, up more than 4 percent from last year, according to a Douglas Elliman report. Average rents in the hot part of northwest Queens, which includes Long Island City, dipped 13 percent to $2,750 a month as smaller apartments — especially one-bedrooms — made up a greater share of transactions. The analysis from Elliman, which crunches the numbers slightly differently that Citi Habitats, found average Manhattan rents hit $4,081 a month. That wasn't a record monthly price, according to Elliman's data, but it was a record for four consecutive months above the $4,000-a-month threshold. Many New Yorkers are considered "rent burdened," with roughly 55 percent of tenants spending more than 30 percent of their annual income on rent and more than 30 percent spending more than half of their income on rent. The high cost of rent is on the forefront of the political agenda as Albany gears up for the June 15 expiration of the city's rent regulation laws and its 421a program giving tax abatements for new projects. Mayor Bill de Blasio is calling for strengthened laws to prevent thousands of rent stabilized units from going market rate. He has also proposed reforming 421a in efforts to help the city build thousands of new affordable units.